Sundown can turn the sky into an array of colors such as this over Lobster Cove Lighthouse where the sun has almost retired for the day in Newfoundland Labrador. Above Lobster Cove Lighthouse in Newfoundland Labrador, sundown turns the sky into fiery orange, yellow and pink hues which is incredible to watch from Rocky Harbour in Gros Morne National Park. Sundown is one of the prettiest times of day at Rocky Harbour with the sun reflecting off the surface of the water creating magical lighting around the area. 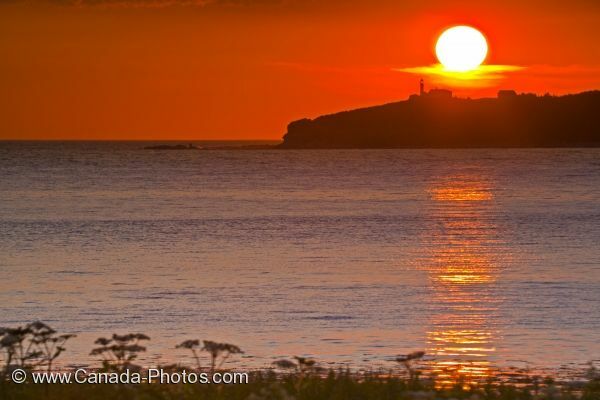 Picture of sundown from Rocky Harbour in Newfoundland Labrador, Canada as the glowing sun silhouettes Lobster Cove Lighthouse.